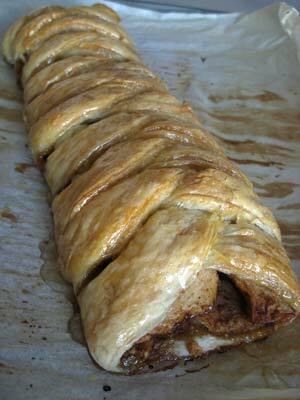 Apple strudel; photo by Renée Suen on Flickr (noncommercial use permitted with attribution / no derivative works). 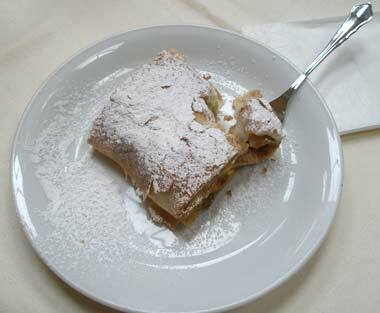 Strudel was recognized as an official state pastry of Texas between 2003 and 2005 (along with sopaipilla, a native pastry). Strudel is one of many 'Danish' pastries Americans love. 'Strudel' is a German word, but the origins of this pastry actually go back to the Greeks, who first perfected the technique of making thin dough for Baklava. Traditional strudel dough can be stretched paper-thin over a large, flour-dusted table without tearing. It's said the art of making strudel dough takes decades to perfect - professional pastry makers are often over 70 years old and learned the craft from their mothers and fathers. Modern recipes usually call for easilly purchased Phyllo dough (which is Greek). Towns with names like Fredricksburg, New Braunfels, Bergheim and Boerne reveal the German influence on the early settlement of the Texas Hill country. In the mid 1800's social and political conditions became intolerable in some areas of Germany, and fearing persecution in their homeland, about 10,000 German families immigrated to the hill country of Texas. German artists, writers, poets, university professors and scholars came to Texas and became farmers, ranchers and cowboys. Fredricksburg is the largest of the German towns in Texas and it retains much of its old German heritage and culture. The residents hold Sangerfests, Shützenfests, Weinfests, Kinderfests and a traditional Octoberfest every year. They also hold rodeos, barbecues and an Indian powwow. The small community of Danevang is known as The Danish Capital of Texas. Here, presumably, you will find the best Texas German strudel. Slice of apple strudel; photo by gTarded on Flickr (noncommercial use permitted with attribution / no derivative works).